Ascension is the raising of our awareness. Ascension is the raising of our vibration. Ascension is the raising of our consciousness. Ascension starts when we love. This is a time of our ascension. This is a time of our love. Speak your truth - even if others do not listen. Speak your truth - even if others listen but do not hear. Speak your truth - even if others hear what was not said. Speak your truth - even if others hear but distort what is said. Speak your truth - there are times when others listen and hear with clarity. Speak your truth - there are times when others listen and hear what you have said. Open to yourself and your situation. From this expanded place, truly open. Connect and dance with your angels and guides. Connect and dance with your higher self and God. You have access to levels of wisdom and love that are beyond what you have imagined. Sense the love and wisdom of you. Attune to your divine essence. Know that you are love and light. This is your time to create and be. It has been a long time holding up my sword. It has been a long time holding up my guard. It has been a long time refusing to play. It has been a long time holding back my tears. Dropping my sword is not that hard. But opening my heart, this brings up my fears. I feel so exhausted. The sword has been heavy. I feel so exhausted. It has been so long. I feel so exhausted - too exhausted to love. How do I start again? What will I do? The time is different now. There is a new way unfolding. My transition takes time. I want to rest. I let down my sword. I choose to open. But I feel so exhausted, too exhausted to love. The feelings are heavy. I choose to let them in. I can feel myself sinking. Am I able to swim? It is okay. I choose to acknowledge. I accept all rhythms. I accept myself fully. I accept my exhaustion. I have compassion and grace. I honor divine timing. I have patience. I can wait. I honor the process. 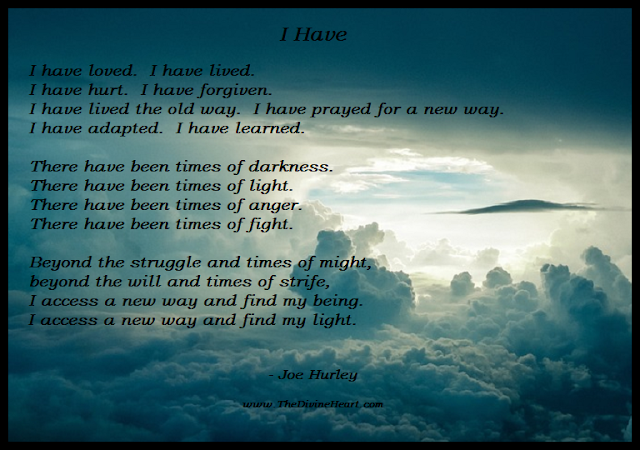 I accept my light. I honor the process. I embrace my flow. It won’t be long now. I am healing. It won't be long now. This I know. Your spirit is your flow. Your spirit is the flow that lights you up. 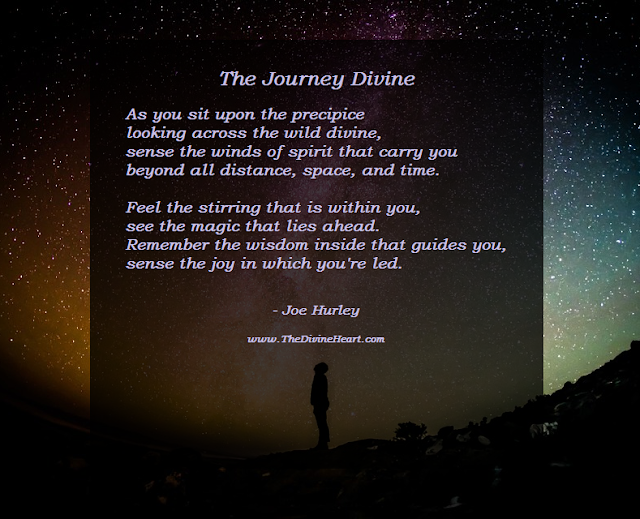 Your spirit is the flow that ignites the love, joy, and happiness that is unique to you. When you attune to your spirit, you may not always get the answers that you want. You always get connected to you. Call on the wisdom of your unique divine essence. Sense the wisdom that is unique to you. Feel the love that is uniquely you. Intend to know the truth that is uniquely yours. This is an amazing time to discover the beauty and magic of who you are. I had many reasons to reject the joy. I was uncomfortable and blue. I wanted to be safe. I wanted life to get better. I wanted my dreams to always come true. But life was not helping. Things were not getting better. I waited for peace and for life to get better. My plan was simple or so I thought. I would will to won’t. I would be strong as a knot. I would sacrifice and protest and never bow. Life would get better, but I did not know how. or how I was attached to the discomfort in life. I did not see how this choice caused my strife. Then one day I awakened. I decided to see. I looked at my truth. I saw the beauty that persisted. It was always there, even though I resisted. The wisdom and love bubbled up from inside. I was happy to know there would be no more waiting. There was still resistance, but I did not force. I acknowledged the path and offered a choice. I invited each aspect of self into life and respected each voice. to open to heart and accept a new place. I no longer had to be perfect in order to be me. as I welcome my new way of wisdom and light. When the system collapses, I will hold space. I will access my wisdom and love. I will access my happiness, laughter, and joy. I will step into a new way of being. I will access my personal rainbow. I will shine clear and true. I will hold space for you to access your wisdom and light. I will hold space for you to be you. I will access my light. Recently, I have been experiencing a unique surprise. This is a feeling inside of true heartfelt joy. It is the joy that I sense in being a part of life. It is the joy that I have of being alive. I call this feeling the emergence of "Happy Joe." It is odd for me to say "Happy Joe." It is actually a bit uncomfortable, but the feeling inside is real. I recognize the feeling inside. It is like a glowing smile that warms and sparkles. I have not had too many real experiences like this in my lifetime, but the experiences that I have had were truly amazing. In truth, I have devoted my life to going into heavier places. On many levels, this was my choice. I wanted to understand and fix all that hurt in life. Somewhere along the way, on my journey through the deep and the heavy, I see that "Happy Joe" was never really given the chance to come to life. I set him aside. I lost him a long while back. Last summer, as my mom passed, I faced my greatest fear: I lost the person that knew the real me. Today, I see that through my relationship with my mom, I was the aspects that she knew I had inside. In loving my mom, I became the qualities that she saw in me. Through my relationship with my mom, I accepted and welcomed into consciousness "Compassion Joe," "Courage Joe," "Grace Joe," and "Unconditional Love Joe." After my mom's passing, she visited me in spirit form with a powerful statement and one powerful wish. She told me our relationship was not over and that her greatest wish was for me to love life again. My heart was filled with warmth, as I connected with her, but I told her that I did not think I could give her the wish. I did not think it was possible. I was aware of my compassion, my grace, my wisdom, and my love. 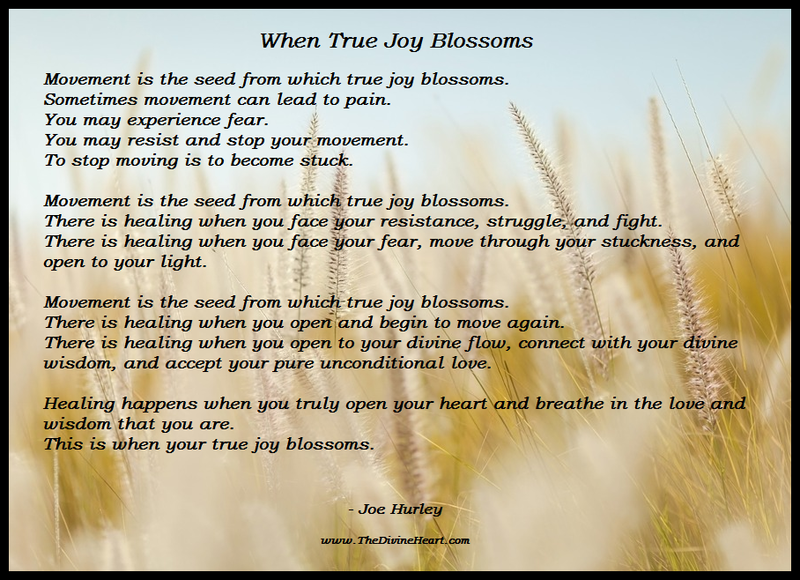 Spending so much of my life focused on suffering had brought these aspects of me to life, but I stopped believing in "Happy Joe" a long time ago. It has been some time since my mom's passing. Unexpectedly, I have been noticing the happiness in those around me. I am in awe of my girlfriend and the level of joy she radiates. And I have seen a side of my dad that is beyond explanation. At 80 years old, he has turned off the television, begun rollerblading in the mornings, playing in the gym a few hours in the mid-morning, ballroom dancing a few hours each afternoon, and he has begun going out on play dates in the evenings to the movies, casinos, concerts, and more. What is this happiness coming alive around me? Is it time for me to accept it? I can feel the support by those around me. And of course, my mom is with me, along with many other angels and guides helping from the spirit realm. 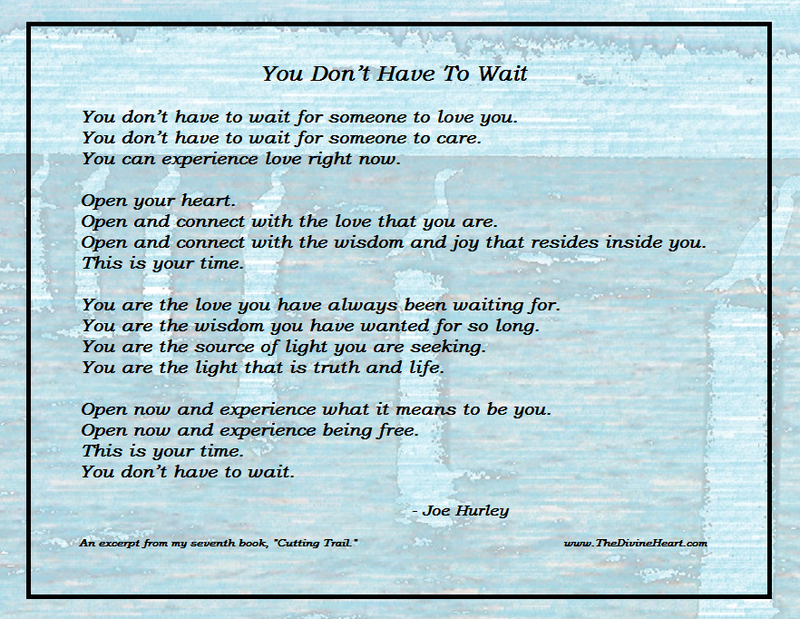 It is a hard for me to believe, but it is true: "Happy Joe" is beginning to awaken. I am starting to feel the joy. In my life, I have been driven to understand the depth of human pain and suffering. Along the way, I have been blessed to experience compassion, courage, grace, and unconditional love. Now unexpectedly, I am seeing the opportunity to embrace a part of me that was lost. Edited from my winter 2007 newsletter. Right now, many of you are experiencing some unfamiliar times. But what is the unfamiliar? As I sink into life, I understand that change is to be expected. With change, we move from one set of dynamics to another. We move from one job to another. We move from one house to another. We move from one city to another. But what happens when we change our jobs, housing, geographical locations, relationships, and we don’t know where we are going? Many of us today are making changes in life without knowing the outcome. We are stepping into the unfamiliar. Internally, we are stepping into a totally new way of being. Externally, we are birthing a totally new way of co-creating. We are evolving internally and externally. When we truly let go of outdated concepts, rules, roles, and old ways of being, it is expected that we step into the unfamiliar. It is expected that our situations will seem surreal at times. These unfamiliar times can be scary. It can be uncomfortable having no idea what to do about work, money, housing, or relationships. Are you experiencing the unfamiliar? Are you uncomfortable or afraid? It is okay to welcome the discomfort and fear. Invite all aspects of self into love. 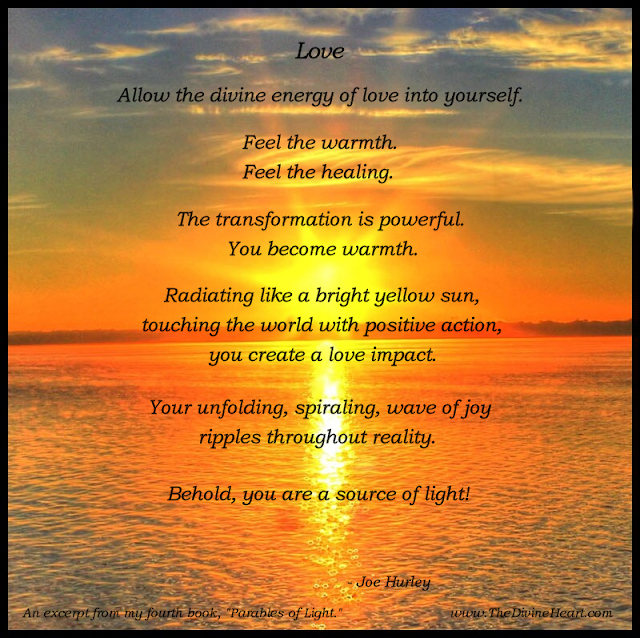 You may be experiencing the unpleasant, but you are a being of love. 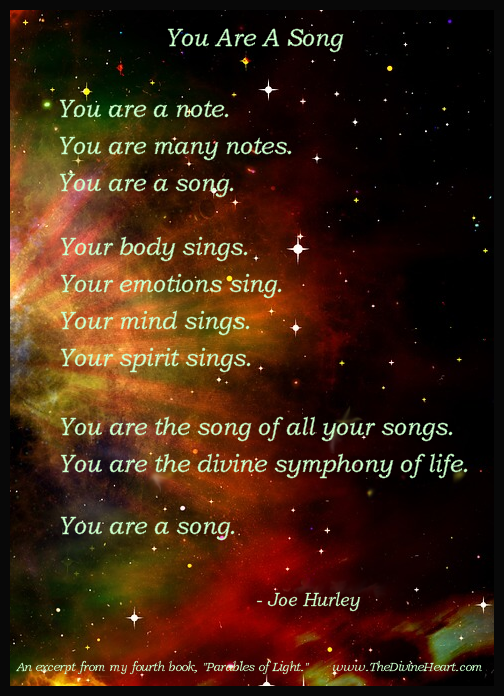 You are a truly a being of wisdom, love, and light. You can access your heart and love all the parts of yourself that are uncomfortable. You can open to your wisdom and reassure yourself that all is well. You can open to your joy and honor what makes you happy. As a being of wisdom, love, and light, these times in the unfamiliar can also be adventurous. 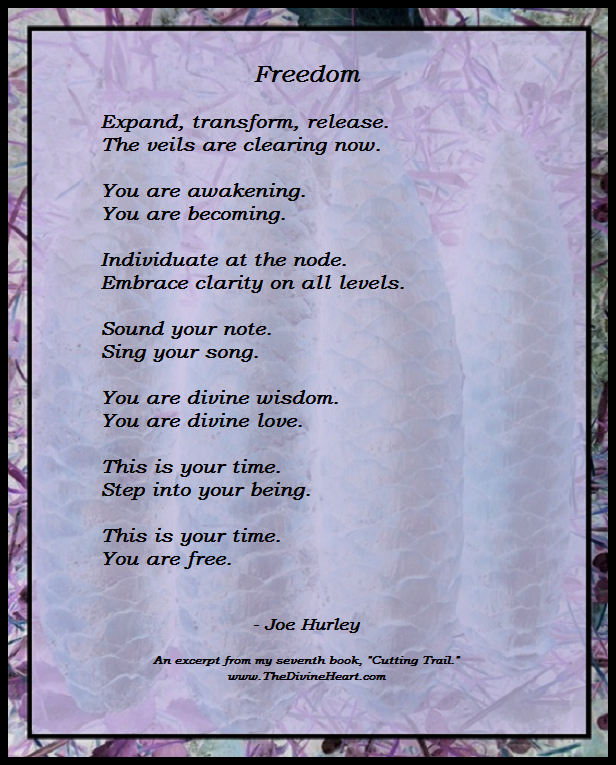 Take a moment and open up to your divine essence. Take a moment and connect with your divine awareness. With divine awareness, you sense divine timing. You embrace the magic and mystery of the unknown. You open and appreciate the wonderful and the miraculous. In these times of the unfamiliar, you have amazing access to your knowing. You are fully aware of the uncertainty, but you also know. You know that all is well. You know that all outcomes are okay. You know that love is everywhere. 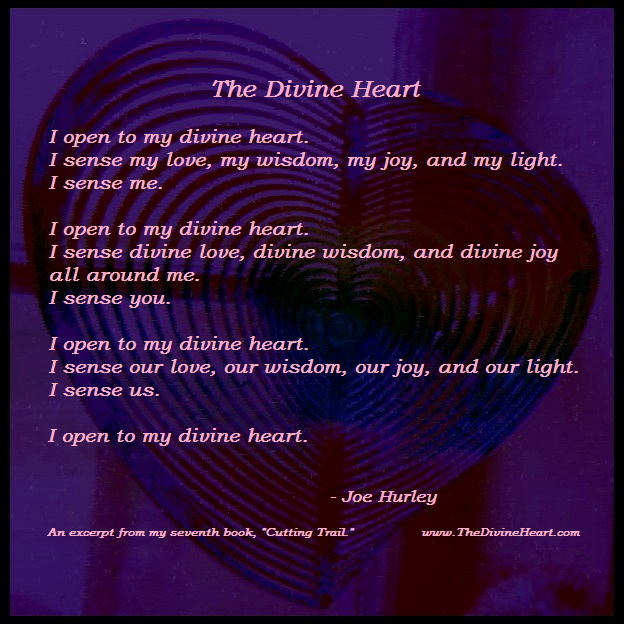 You know that you are a divine being of wisdom, love, and light. With this knowing, you can relax into the unfamiliar. You can honor what hurts and care for yourself. You can open to your joy and celebrate life. You can be your true and authentic self in all situations. You can be truly free.